You guys know I am all about saving a buck where ever I can. Its something I have had to really buckle down on since my kids were born and my husband and I decided I would stay home full time with our kids. Over the years between shopping sales and using coupons we have been able to save thousands each year. 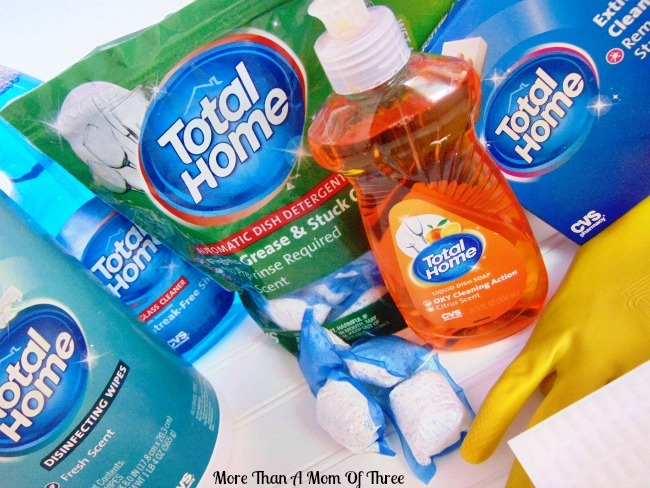 Saving money on our weekly groceries, personal care and home items have become a new way of thinking now for me. I look back on the days before kids and grab whatever I thought I needed and want to kick myself because I could have saved so much money! 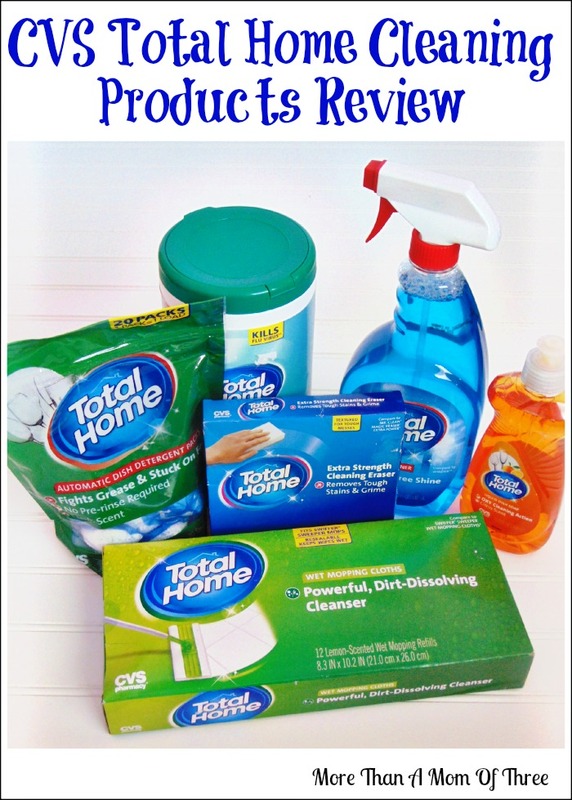 I still shop sales regularly and clip coupons when they are available but one thing I started to do was try out store brands of products I normally buy. It was one of those things I never did, even when I was heavily into couponing because I felt some brands I was loyal. If my mom used name brands on specific items, it was what I was used to so I continued in her path. My thought was if it works stick with it, why switch? 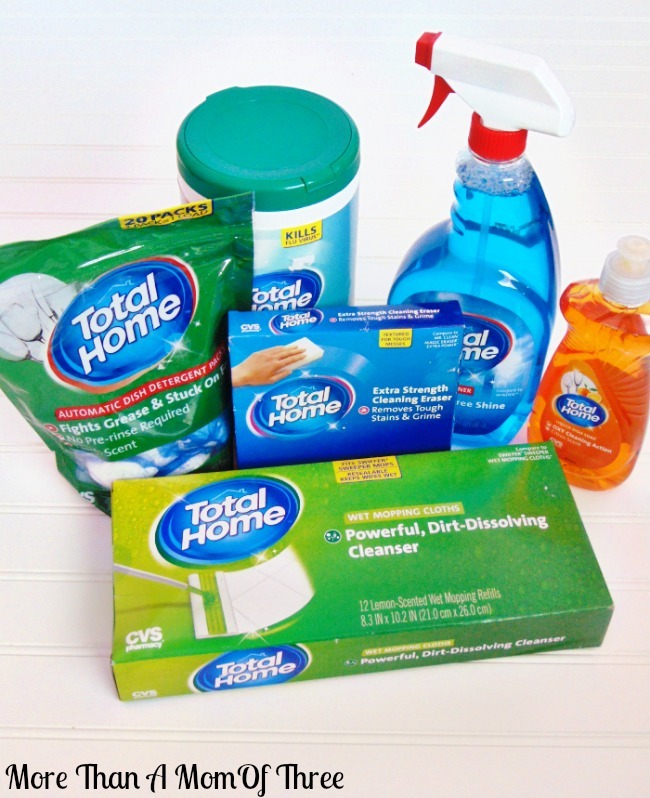 I was recently contacted by CVS to try our their Total Home line of cleaning products. I have never used a CVS brand cleaning products until then so I was excited to see what the difference was between theirs and the name brand. I have to say every single item I tried was a great match up and was just as good as all of the name brand items I tried. The only complaint I had were the dish detergent packs. Our dishwasher is a detergent snob overall and I found only the small liquid filled no powder solution at all works the best. If the tab is too big it does not completely dissolve properly. But that is just my dishwasher, if you don’t have a problem with yours then these still cleaned really well. I did a little price matching too off their website. Keep in mind these are not sale prices for either items. 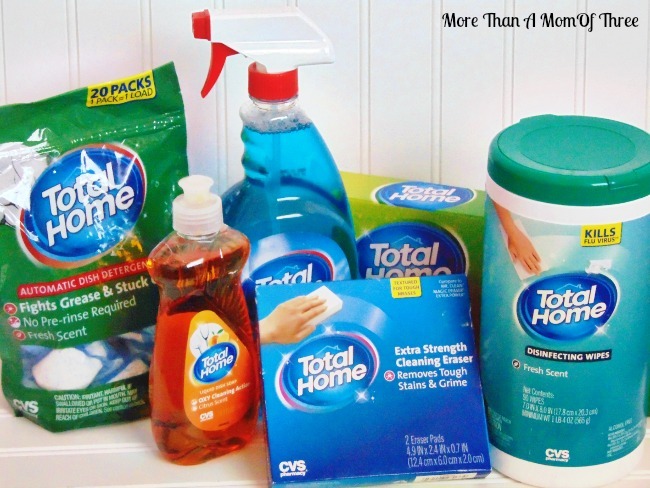 I found that the savings for the Total Care products were about 15% – 20% lower than the name brand. For a product that works just as good and is that much cheaper to me its a win win! 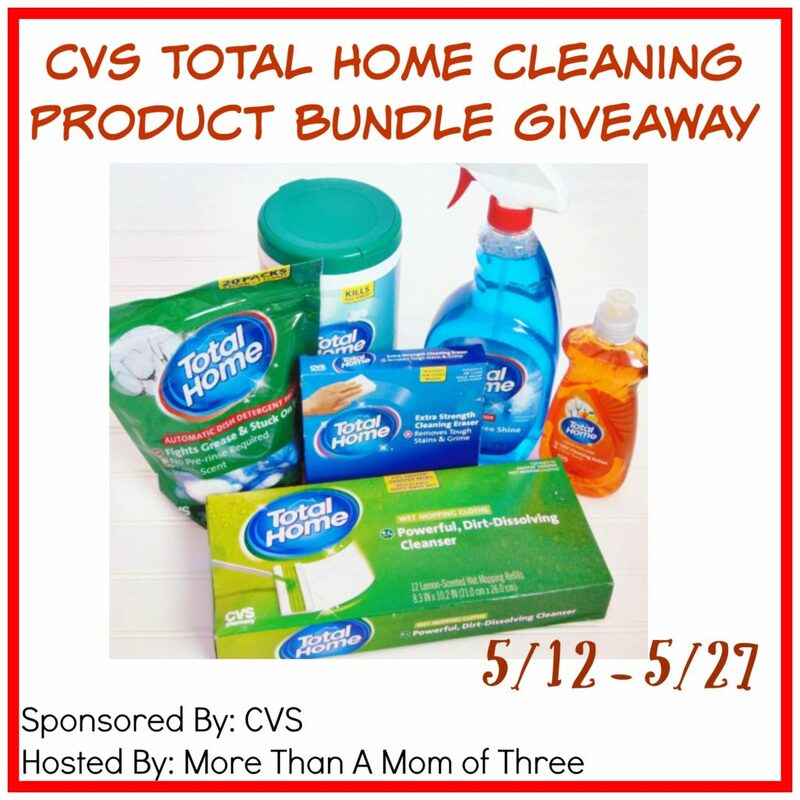 On to the CVS Total Home Cleaning Products Giveaway! 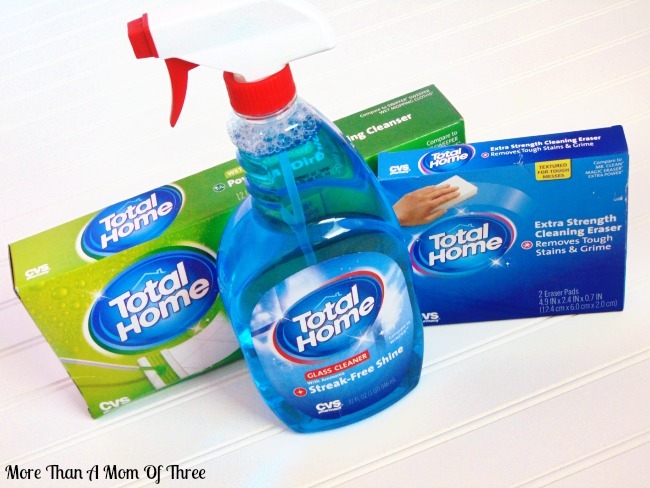 Want to try out the CVS Total Home Cleaning Products for yourself? I have a great giveaway for you! 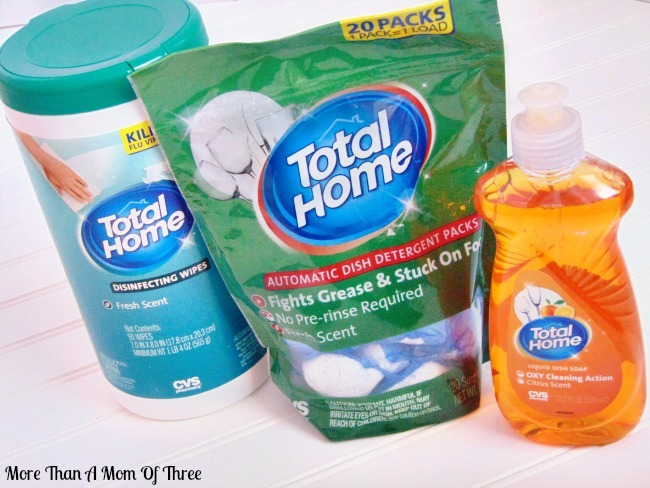 CVS is giving away one More Than A Mom Of Three reader the same CVS Total Home Cleaning Product package as I received. Worth about $50! Entry is simple just follow the directions below. More Than A Mom Of Three is not responsible for the delivery of the giveaway prize. i hate to clean my bathroom! I love CVS products I think they are better than name brands at half the price! Thanks for this giveaway I just entered! I hope I win! I do not like to clean the top of the fan I can not reach it! I dislike having to clean the bathroom! I don’t like to clean the kitchen. I least like to clean my bathroom, which I just did tonight… blah!!! i hate cleaning my kitchen. I dislike cleaning the bathroom, especially the shower area. The bathroom is the least place i want to clean. I hate cleaning my kitchen! I don’t like cleaning the tub. I hate cleaning the bathroom and I hate doing laundry. It never ends! I would have to say the kitchen!! For me the worst thing for me to clean is the bathroom. it’s a tie between the bathroom and the kitchen.. they both stay equally messy! I hate to clean my extra room for “extras,” it is always messy no matter. Sandy recently posted…Anavita Moisturizing Anti-Wrinkle Cream GIVEAWAY! I absolutely dread cleaning the bathroom… especially having to get down on my hands and knees to scrub the bottom section of the toilet. Yuck!! I’m always looking for ways to save money. If these products work like the brand names ones do, then there is no reason to not buy them.